are you convinced of making kids gifts yet? 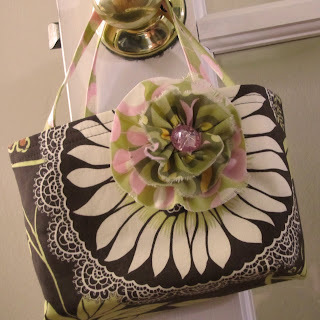 I used Amy Butler Lacework /Olive for the outer, Garden Maze/Olive lining and Martini Dot/Blush for the straps and flower. We are going to fill the purse with nail polish and pretty tissue then it will be our gift bag also! 3. Cut Handle cut 2 pieces, bias tape can be used or you can make your own, ribbon is also nice here. sew side seams on outer 5/8"
-rip 2 strips of fabric one aprox. 2x10 and one aprox. 1x8 I just eyeball this for the size of flower I am wanting, and I like to rip the fabric to get frayed edges, they could also be pinked. 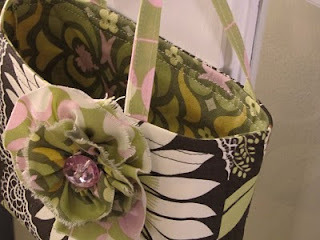 -pull the thread to gather, as you do this the fabric starts to curl, let the fabric shape itself and once you get ot the desired fullness spiral the gathered ends around and add a needle to the gathering thread and stitch flower middle to secure it, add a button ad pin back or stitch directly to purse.